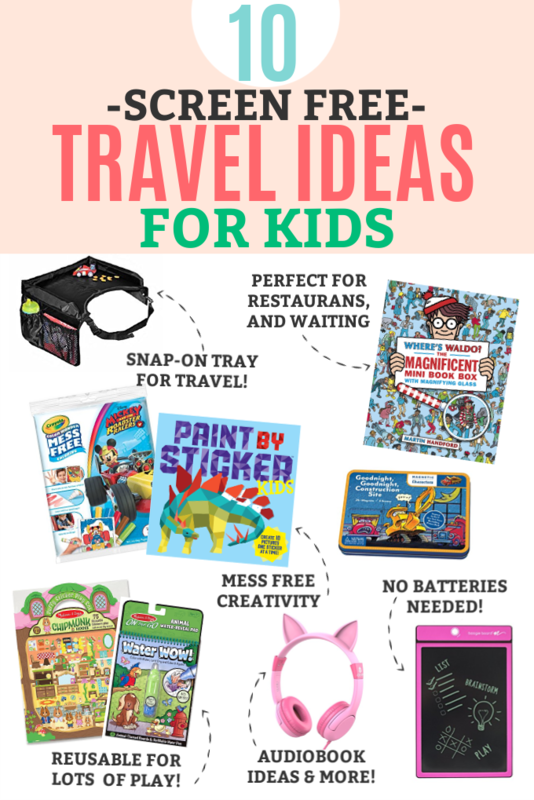 Our Favorite Screen Free Travel Ideas for Kids – Our favorite toys and activities for planes and car trips–no batteries required! My friend gave some of these puffy sticker books to my kids several months ago, and we’ve gotten a LOT of play out of them. So much so that these were the first thing I picked up for our summer travel. Even with a LOT of use, these reusable puffy stickers really last a long time. I’ve mentioned these before, but Boogie Boards are one of our tried-and-true favorites. These reusable tablets are thin, lightweight, and don’t require batteries or a charger. We got the original generation one and it’s been going strong 2.5 years later. You can draw, write, play tic-tac-toe, practice math or handwriting, play hang-man, doodle, and more. Beyond travel, we use these at church, in waiting rooms, at restaurants, etc. PS – I haven’t tried this brand, but they’re only $9.99 and have great reviews! Color Wonder books were my salvation when my kids were younger, and we still really enjoy them now. They’re MESS FREE markers that ONLY write on the special color wonder books/paper. That means when your 2 year old gets distracted and starts “coloring” on their carseat, clothes, and siblings NONE of it will make a mess. No mess, no stains, no surprises. I love them! If you need a more compact option, these Magic Ink books are really fun. They’re smaller and only come with one magic marker that reveals all the hidden colors in the picture. They come in ALL sorts of different versions–Disney princess, Incredibles, Mickey, Paw Patrol, Star Wars, Thomas the Train, Ninja Turtles, and everything in between. These “snack and play” travel trays are really, REALLY good. We’ve had them for 2 years and they’re still in great shape. I love that they have a bunch of side pockets that can hold cups or small books, and the trays themselves are great when kids want to color or play with a toy without worrying about dropping things all the time. We’ve only used ours in the car, but some reviewers have brought them on airplanes with them, too. I LOVE love love these Water Wow! books. They come with a small brush pen that you fill with just a few tablespoons of water. Then you “paint” with water to reveal the colors on the picture. What I love is that they’re REUSABLE. In just a few minutes, they dry back to white and you can start all over again. We travel with two, which my kids trade back and forth. I love that even if the pen spills, it’s only a tiny bit of water which will dry quickly. Get them in a 3-pack or pick one for about $4-5. Pro tip: holding these next to an air conditioning vent for a minute will dry them even faster. There are SO MANY fun audiobooks for little ones. Download one to play in your car (or pick up some kid-friendly headphones for a plane). Or, check out the audio CDs from your local library! These paint by sticker books for kids are one of our favorites. Sophie has loved them and used them for 2 years (she’s 7). Milo (5) is just getting into them. They take a bit of patience and concentration, but that’s part of the beauty for a car or plane trip. I’ve seen these little magnet fun scenes for $3 in the Target dollar spot in versions from pirates to mermaids to vehicles, and more. I couldn’t help but love this Goodnight, Goodnight Construction Site one on Amazon! 9. Where’s Waldo? or I Spy Books. These are SO GREAT for keeping kids busy! We typically don’t use these in the car (for carsickness reasons), but we pull them out at restaurants, waiting in lines, or on planes. There are so many ways to play with them and so many things to find! This little boxed set is only 6.5 inches tall, so you could easily put them in a child-sized backpack or a purse. Granted, these organizer bags aren’t necessarily an activity of themselves…BUT. These are FANTASTIC for organizing any toys, supplies, or activities you want to bring along with you. Use them to store markers, or a set of toy cars, or Barbies, snacks, drawing supplies, car games, a grab-and-go diaper change kit, and more. Not to mention that you can use them to pack kids’ outfits, shoes, toiletries, travel documents, phone chargers, and more. We LOOOOVE them. 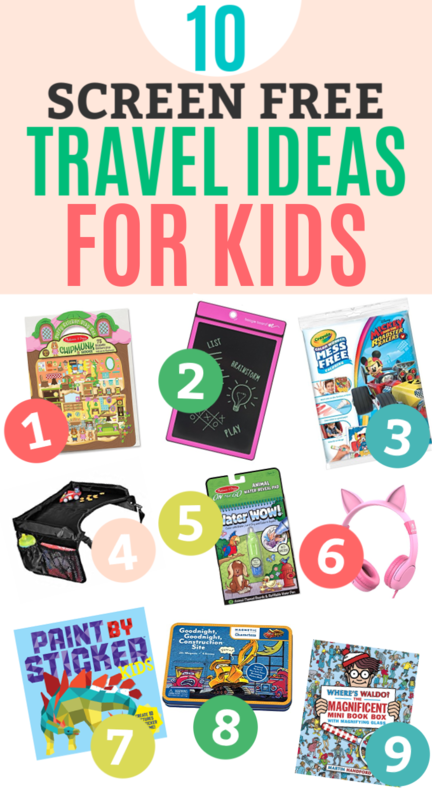 Those are my 10 picks, but I’d love to know: what are YOUR favorite travel ideas for kids? Chime in below! My kids love to draw. We have clipboard cases that snap open to hold paper/pencil/eraser on the inside so they don’t get lost in travel and it provides a hard surface for drawing like a mini lap desk. I use them for school and meetings too. Target and Staples carry them. Thank you for this today! 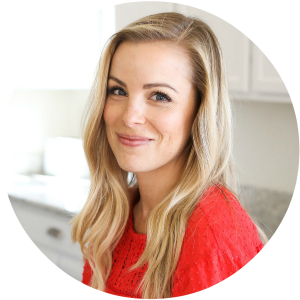 We leave for an airplane trip with a 2 year old next week – getting on Amazon now! Good LUCK! I’m cheering for you from here!